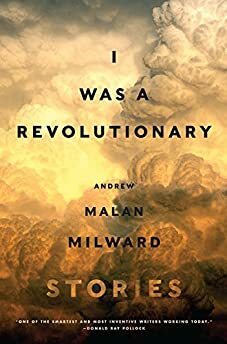 Largehearted Boy: Book Notes - Andrew Malan Milward "I Was a Revolutionary"
Book Notes - Andrew Malan Milward "I Was a Revolutionary"
Andrew Malan Milward's short story collection I Was a Revolutionary offers a mesmerizing amalgam of fact and fiction, past and present. "The rich, brutal history of Kansas ignites - and propels - the eight stories that make up Andrew Malan Milward's accomplished second collection. By its conclusion, the reader is left considering many questions of history, identity, race, and how we retell these stories to others and ourselves." Music played a big part not only in the nine-year process of bringing I Was a Revolutionary into the world, but in my life almost from birth. My mother was a folksinger in the Sixties, part of a trio called the Taverniers who were popular in central Kentucky, and as a boy I grew up in the communal storytelling atmosphere of her and her friends who were writing and singing "hard hitting songs about hard-hit people," to quote the title of a great collaborative book by Alan Lomax, Woody Guthrie, and Pete Seeger. There are eight stories in my book and I think of each piece having a corresponding song that played a role in its completion. I present them here as a kind wine-food pairing. This song pairs well with "The Burning of Lawrence," not only because it's about Quantrill's raid on Lawrence, but also because this song is referenced in the story itself. In the story the present-day female narrator is fascinated by objects that depict the raid, this song being one of them. What's interesting, and unsettling, about Joan O' Bryant's song is that it depicts Quantrill as a kind of Robin Hood-like hero and his massacre of free-state abolitionists is sanguine in tone. For a long time this story was called "Nicodemus," which is the name of the all-black settlement my characters are trying to reach after Radical Reconstruction of the South was abandoned. A few years ago, shortly after I moved to Mississippi, I was paying a visit to Holly Ridge, Mississippi, a Delta town so small that neither Wikipedia nor any online source I can find for that matter lists a population. Besides the handful of houses I saw, there was a large gin mill that seemed abandoned or at least no longer in operation, and a small cemetery, which is why I had come. Charley Patton, one of my heroes, is buried there. I parked my car and got out, walking into the cemetery carefully, as it was half-flooded and muddy. It appeared someone had driven a car right through the middle of the burial field. tracts of fertile black loam interrupted only by the occasional stand of pecan or Cyprus. I'd about given up, figuring the tombstone was either underwater or perhaps had been stolen as some kind of macabre souvenir by a fan, when I saw what appeared to be a large bottle of Bulleit bourbon next to a grave on the other side of the field that I'd somehow missed. I knew if had to be his, and so it was. Lord, I know. Lord, I know. Lord, I know. Something in the song—perhaps the image of a physical manifestation of Death entering a room and taking the speaker's mother—captured some of the overwhelming sense of sadness and despair I felt that day in the cemetery, where the dead had not been given the dignity of care, respect, and thus, so I imagined, rest. Listening to the song closely and repeatedly allowed me to find a way to re-enter my piece about Nicodemus and tap into the emotional reserves I'd been unable, or unwilling, to countenance for years. I was grateful to Charley Patton and to the song, and so I changed the title of my story from "Nicodemus" to "O Death." One half of this bifurcated story involves the history a man named John Brinkley, better known as the Goat Gland Doctor because he became rich and world famous for ejecting goat testicles into men to improve their virility in 1920s Kansas. There's so much craziness to his story, but for our purposes here it's enough to say that he also was a pioneer of early radio. He used it to promote his goat gland procedure, but he also knew he had to entertain listeners, so he hired top-notch performers to play music for his station. One such act was The Carter Family, whom he signed to sing exclusively for his radio station when weren't known much outside of Virginia and the region. Brinkley had one of the most powerful radio stations in the world and because of that he brought the Carters the fame they deserved. This song is from volume 1 of the terrific Mermaid Avenue records that Billy Brag and Wilco collaborated on, putting music to lyrics that Woody Guthrie had written many decades earlier. Long before I knew what the story would be about, I knew I would use "Hard Feelings" as a title somewhere along the way because of a line from this song: "Maybe if I hadn't seen so much hard feelings / I might not could've felt other people's." There's a joke in this story where the young Assistant wonders how long the older Historian character is going to keep up the "concert-T's-from-my-twenties theme" because she's shown up wearing Liz Phair and Yo La Tengo shirts on consecutive days. A lot of songs I'm drawn to, and which appear on this list, are heavy and sad. It's really hard to capture joy in a way that doesn't feel saccharine or cheesy. This song makes me feel unadulterated happiness. I like to think that's why the Historian is still wearing her Yo La Tengo T-shirt after all these years. As you can see, I basically took the title of Woody Guthrie's song about Sacco and Vanzetti and repurposed it for my story about the workers in a packinghouse in Dodge City, Kansas. The story takes place entirely in the workers' favorite bar on a night after everyone's been paid. It's a seemingly normal night that ends in two deaths. Like Charley Patton, Woody Guthrie is a hero of mine, and the elegiac quality of his song seemed fitting for my story. This is an old IWW song I first heard on a compilation called Rebel Voices. Pete Seeger does a great version of it too (as have countless others I'm sure), but Fred Holstein's version, recorded live, moves me to tears. It's a song I can imagine the twin socialist heroes of this story, S.P. Dinsmoor and J.A. Wayland, having sung with their Wobbly comrades. "Girl from the North Country" (Nashville Skyline version) "I Was a Revolutionary"
There's a scene midway through the story where the narrator, who is a professor, goes to a bar with a couple of students. The hipster bartender sort of ignores them for a minute as he works to pick out the perfect record for the start of his shift and he puts this record on and suddenly "Dylan's strange country croon fills the bar." I love this record, so I found a way to sneak it into a story. However, the more I think about it pairs pretty well with the story. The protagonist was formerly a radical and very active politically as a young man but has fallen into a kind of complacency in middle age that he comes to regret. It's not a perfect analogy, but there's something similar that went on with young Dylan, the "protest singer," leaving political commitment behind, along with his acoustic guitar, to write non-topical rock songs on his electric. I say this as someone that loves both sides of Dylan, unlike my mother, the old folkie, who still views him as a traitor. The quickest way to get a rise out of her is to tell her that electric Dylan is way better than acoustic Dylan.